Again, I hate it when someone like Khamenei is telling us the truth! But I don't get it, how does 'addressing the UN Security Council resolutions, with a view toward bringing to a satisfactory conclusion the UN Security Council's consideration of this matter" not include Iran's ballistic missiles when there is a U.N resolution that forbids Iran from testing them? Could you please clarify on that specific point? The JPOA could not be any more clear that that: In order to take the final steps, which includes lifting of all sanctions, including those set up by UN Security Council, the four sets of UNSC resolutions need to be addressed by both sides and come to a satisfactory conclusion. The two sides needs to address 1929 in one form or another. All the five members of UNSC have of course voted for it and are part of the negotiations. Saying that consideration of ballistic missiles is an Israeli plan, misses the point that it is part of UN resolutions and Iran has agreed to resolve all issues related to those resolutions. So instead of sloganeering, it’s best to find practical answers to what could be done that would be acceptable to both sides. it "would be politically untenable" for Iran to do xyz because it would lose the support of its people by doing that act. What are you going to do Mark? move out of Iran, and live in the West? Every morning miserable and opposed Iranians get up in that country and pray for an end to this evil regime. yet this person who doesn't even live under the regime works against their wishes by propogandizing the regime. Unspeakable evil. I am not a party to the agreements, so no need on your part to agree or disagree with me. It is the Iranian government that has signed the JPOA, which sets up the roadmap for the on-going negotiations. That JPOA includes specific language on the need to consider and resolve the issues contained in the UN resolutions, including Resolution 1929 that includes specific language on ballistic missiles capable of delivering nukes. This issue, regardless of what I think, needs to be addressed and resolved. There are no two ways about it. It could be solved probably by distinguishing different types of ballistic missiles, most probably based on their range, or any other criteria to satisfy the UN resolution. The two sides need to find a practical solution to Iran's needs. For example, does it need ICBMs if it does not build nuclear weapons? A practical solution has to be found based on Iranian needs to resolve the 1929 issue. U.S., Russia, China, Britain and France voted for 1929. Those five countries, along with Germany, agreed with Iran last November in Geneva to take steps to address, among other things, that resolution. This is where things stand. Sloganeering and linking whatever one doesn't like to Israel does not change the facts. BTW, you should know by now how much damage Ahmadinejad caused which led to the approval of these resolutions in the first place; and then he called them "torn papers." That irresponsible attitude has now come back to haunt the Iranian team at the negotiation table. Thank you, AnonymousFebruary 24, 2014 at 9:07 AM!! Just another example in a long history of them, showing how dishonest all the so-called "concern" regarding Iran's nuclear programme, is. That is ongoing but, the American regime have already raised another issue! The nuclear programme is just an excuse. Give America an inch and it will take a mile. Gareth Porter is a disgraced person who is not employed as a journalist by any reputable news site.... and hasn't been since he published a book denying that the Khmer Rouge was committing genocide. even when the evidence against him was overwhelming, he continued to lie about it. it's not surprising that the fanboy would give publicity to Porter's dishonest views. Which part of "the topic of ballistic missiles is not part of the interim accord reached last November." and "Nothing except Iran's nuclear activities will be discussed in the talks with the [six powers known as the P5+1], and we have agreed on it," do you not understand Nader? I understand, but do you? Again, you are arguing with the wrong guy, the JPOA was signed by the Iranian government. If you don't like that, you should address it to Zarif, Rouhani and ultimately Khamenei who has approved it. It is the JPOA which calls for specific steps to resolve the issues in the UN Security Council resolutions, including parts of 1929 on ballistic missiles. The principle of dialogue, compromise and negotiation implies that both sides mutually, tacitly agree to close their eyes on long-standing and irreconcilable issues not critical to overall success, while putting the emphasis on peripheral, more global and effective fields of discussion where there exists credible and exploitable space for true negotiations. 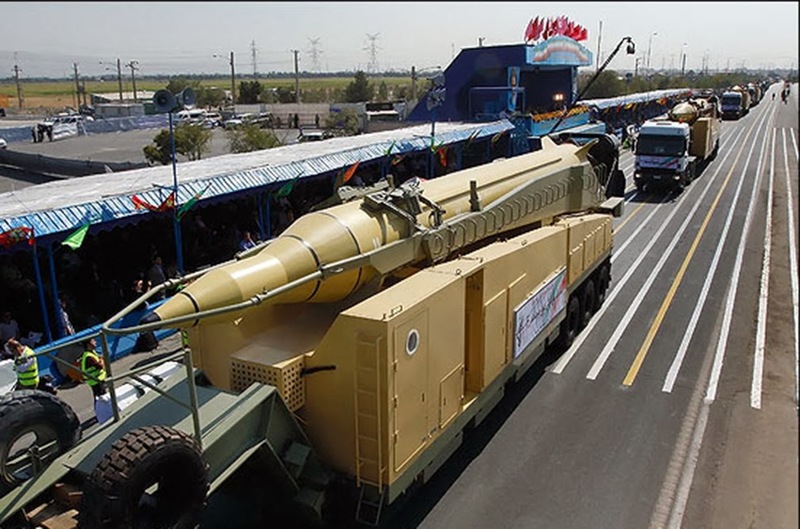 There are many ways of reaching a consensus on specific provisions to the JPOA allowing Iran in continuing with its indigenous program while putting a cap on potentially hazardous step-ups such as moving towards more ambitious delivery vectors more exclusively associated with the use of a nuclear payload in both tactical and strategic qualities such as ICBM production capability, programs and doctrine that are not even an official requirement nor a target of Iran's armed forces. That issue needs not become a stumbling element to either parties engaged in negotiations, if one assumes that both are equally bent on moving forward in all frankness, sincerity and animated with a genuine desire in reaching a satisfactory compromise to ultimately end a decade-old stand-off plaguing international relations, unnecessarily heightened regional tensions and thus having benefited circles of hardliners on every side for too long already. Iran cannot afford to willingly scuttle its hard-earned self-sufficient capability in locally producing high-end hardware and weapons in recent years, so either the Security Council offers it viable and measurable incentives in permitting future acquisition of at least 4th gen aircraft to replenish its air-force capability in defending the country more effectively than it currently does with legacy planes with sensor and weapon upgrades as a bargain to relinquish part of its missile capability, or it opts for the provision option detailed above. If any western country standing at the P5+1 table thinks it can have it both ways in utterly suppressing Iranian missile capabilities AND maintain the current embargo on Iranian acquisition of modern fighters and/or related co-production and development deals like say Pakistan or India do respectively with the JF-17 and the PAK-FA, it better stop wasting its time and energy and quit it altogether right now. No one in Iran could afford to accept that, and none should make any mistake on that, again this is basic logic and decency, these would not be negotiation but demands for capitulation. In my personal view, the only way in successfully making such demands and make Iran abdicate in executing them would be to go to war with the latter and win. Period. In no other universe would anything like it happen. Thanks for all attention you guys have bestowed on me. But I need to disappoint you: I have no problem personally with ballistic missiles issue not to be included in the on-going comprehensive talks. What I have told you here is that notwithstanding your opinion on the subject, the Iranian government has signed off on JPOA issues, which include UN resolutions, including 1929. And please note that the UN resolutions need to be reversed if a comprehensive deal is to be struck, because that's the only way to end all sanctions against Iran. Hence their inclusion in JPOA. ...and you think the Mullahs would risk getting attacked...course they wouldn't...they will fold rather than getting blown to smithereens. you're being, extremely deceptive, and distorting the facts of the topic on behalf of the Western Zionist Regime. (U.N.S.C. 1929) 2010, is totally about imposing an entire Weapons freeze on the Iranian Government. Paragraphs 6 through 9 imposes a total band on Nuclear Weapons, and Peaceful Nuclear Technology and the import and supply of necessary Weapons for National Defense, Including Tanks, Artillery pieces Combat Helicopters, fighter planes, conventional Armour, warships. No Interstate transfers of supply and support nor production or the Manufacture of conventional Weapons of any kind. Who do you think you're fooling! Occasionally you do have educated people, that read your Blog. No Nation would be willing to sign away it's right to it's own National defense. And to correct you for the record, The Iranian Government did not agree to this resolution. The previous resolutions, agreed to by Iran in 2003, and in 2007 did not allude to the total forfeiture of National Defense, and the Iranian Government signed the Resolutions in good faith with the intent of a Nuclear Weapons free Middle East, with Israel's full cooperation and complicit behavior, in mind. Paragraph (8) Reads as follows. '8. Decides that all States shall prevent the direct or indirect supply, sale or transfer to Iran, from or through their territories or by their nationals or individuals subject to their jurisdiction, or using their flag vessels or aircraft, and whether or not originating in their territories, of any battle tanks, armoured combat vehicles, large calibre artillery systems, combat aircraft, attack helicopters, warships, missiles. No Nation in their right mind would agree to this total forfeiture of national Defense. that is why it is no longer being discussed in Geneva.The entire Resolution was a political ploy to totally weaken the Iranian Government and disarm it. and don't insult the posters on this Blog by saying that it's not. you're a journalist, Sir, where's your integrity. I hope you're fair and objective enough to post this. Nothing will save the zionism from its demise, despite the recent "surge" of its supporters on this blog..... and discrimination of others. US adoption of zionists' demands is futile, because it is the Russia that is slated to win (for instance at the Olympics) and which is moving toward the Iran's defence. Please read my comments above at 9:39 PM. You should send your objections to the Iranian government or to P5+!. This lowly blogger had nothing to do with JPOA signed by Iran and the six powers. absolutely, this is precisely that strong sense of self-preservation you describe that initially motivated their drive to acquire ballistic capability 20 years ago and their unconditionnal willingness to preserve it today. And they know that western powers would not go as far as a full-blown military conflict with Iran on the sole basis of their inability to reach common ground on every paragraph of the JPOA while they have made so much historical progress on the nuclear issue, with business delegations from all over the world including France , Germany and the US already lining up to kickstart dealings with the country the moment sanctions get lifted permanently. No, they will not "fold" based on some non-existent fear of immediate aggression but will rather remain firm based on an existing, longstanding concern for military sovereinty and deterrence. It has been working fine during a much more tense geopolitical context during Ahmadinejad's era, I certainly do not see it failing anytime soon for such "Detente-oriented" context. Gurney do you really think the us would be so stupid as to start a war with iran at this point in time?,do you really think that the us would have capitulated on its demand of "zero enrichment" and then had to sit down and negotiate if it thought for one moment that the military option was at all credible? I agree with everything you write in your comments. Nothing short of a full military conflict will stop IRI from giving up their only decent detterent capability and I am not sure if the Americans will be willing to go that far, if a comprehensive deal on the Nuclear issues can be negotiated. Entirely agree, as always dear K.
I hinted myself above at that very reality in Iran's current doctrine when it comes to the range and accuracy of its missile arsenal. They have proved that the core of their ballistic development effort is directed at gradually improving its assets' accuracy via a currently spreading network of ground-based GPS centers for course correction over Iran itself, plans for putting indigenous GPS satellites in geostationary orbits in a couple of years for global guidance, newer and more advanced laser gyroscopes for the inertial guidance phase of the missiles, strengthening of the terminal guidance phase with a glowingly modernized generation of optical seekers and even HARM-type emission-finding warheads for targetting of enemy large and fixed ABM radars, though the latter has merely been hinted during defense events for now, with nothing publicly unveiled or tested to support such claims so far, but I find it quite credible as a natural diversification of their guidance methods, since it answers to an important requirement. Anyway, at this stage the Iranian military is certainly not interested in making more expensive, longer ranged missiles in the ICBM range which are indeed much less practical when used in a tactical quality with conventional warheads, and in that regard, many representatives from both the IRGC and the government repeatedly made explicit statements saying that MRBMs in the 2000-2500 km are enough to deal with any potential regional enemies such as GCC members or Israel for that matter. They have indeed never made any secret in telling the world which are most likely to be targets of their arsenal, and which are not, in any military scenario.